This was one of my most exciting storm chase adventures to date in my young storm chase career. We intercepted two tornadoes within minutes of each other. Saturday morning we got up and read the daily storm expectations on the Internet. The storm prediction center put out a memo early in the morning expecting violent weather. It looked like it would be a dangerous day in the west and one I didn’t want to miss. It looked in the early morning that the weather was going to be the most explosive in Nebraska, so we plotted a course from Greeley, Colorado to Grand Island, Nebraska using I-76 and then I-80. We drove all morning and by 1:30 p.m. we reached Lexington Nebraska. We ran into a storm chase team from Illinois that had 3 vanloads of chasers. We met them at the local Library. We were both there to check out the latest information on the Internet about the day’s weather. After reading all the updates we decided to continue on I-80 to 183 north. The other chasers talked about heading south to Kansas because they thought it looked more promising there but we kept our course for the morning’s early predictions of the SPC. When we got to 183 we traveled north to Ansley and then went east as the clouds looked interesting there, I had no radar in these days in the car. We ran into another chase team and discussed the weather probabilities. We followed them north up to a point until I felt like we needed to change directions again. We left them behind and headed east until we go to 281. We started north on 281 and drove for about 20 miles until we stopped. The chances of catching a storm looked bleak at this point with lots of sun. We sat for about 30 minutes and then 6 chasers flew by us headed north. We jumped back into the car and followed them all the way up to O’Neil Nebraska thinking they knew something we didn’t, again, no radar in the car. By the time we got to O’Neil I lost faith in the group of chasers we had followed. All the chasers circled at this point and then we all went our separate ways. I saw nothing north that I wanted to investigate, and nothing east or south. So we headed west all by ourselves again leaving all the other chasers going their own way. As we headed west on 20 I wondered if we would see any tornadoes today. My thoughts quickly changed as it was only about 15 miles later I spotted the blown off top of a thunderstorm. As we approached the storm lightening webbed throughout the clouds over our head. I have never seen lightning this far from a supercell, nor had I ever seen it in the clouds that were being blown off the top of the cell. I knew this was going to be a powerful supercell. 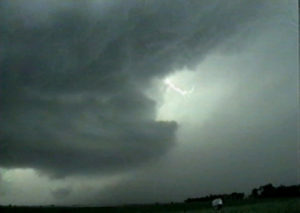 When we arrived at Bassett, Nebraska we were alone with no other chasers visible. We plotted where the storm would track and were trying to decide where to intercept. It seemed at that point the best thing to do was to sit here and let it come to us. Doppler on wheels had been here an hour before this and then left the area. The locals said other chasers were around the area. About then the chasers we ran into earlier near Ansley came into town. Several other chasers begin to arrive shortly after that. Cloud 9 chase tour was also here in the area. In all about 8 chase teams were present now. As the storm moved in the entire group of chasers jockeyed for the best spot to watch and tape the storm as it moved in on the town. At first we parked with about 8 other chase vehicles, but I didn’t like the location so we moved. We headed back closer to Bassett alone and ran into some pro chasers who had mobile radar. They kindly showed us their radar images as they received them by satellite. The dangerous storm was purple on the radar, and we were directly below the purple. We both moved our vehicles quickly and then looked for a new spot to sit. We turned off the main road and went down a gravel road while the other vehicle went east. We moved in closer to the storm and parked in what looked like to me to be the best spot of the day. As we sat we could hear a loud roar in the clouds, like a large diesel engine rumbling at a high speed. The clouds rolled and twisted and bubbled above us. Little fingers dropped down from the wall cloud in front of us. The winds grew in strength and then, one low hanging section of clouds begin to rotate in a uniform pattern. It was no more than 200 yards from us. 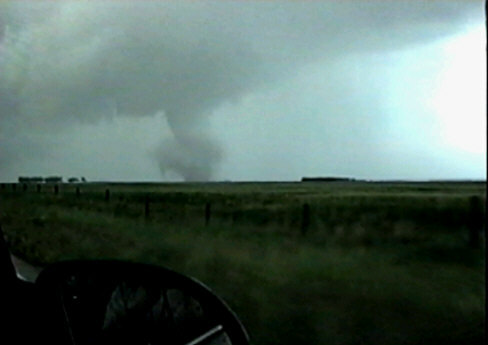 The whole rotation covered about 300 to 400 yards wide and small little twists were clearly visible all around the edge of the rotation. It looked like a slow moving merry-go-round with little vortices on the outer edges dancing around the center. Off to our south there was strong rotating ground disturbance and I thought it would become a tornado touch down as it was rotating on the ground very fast. But it died down. 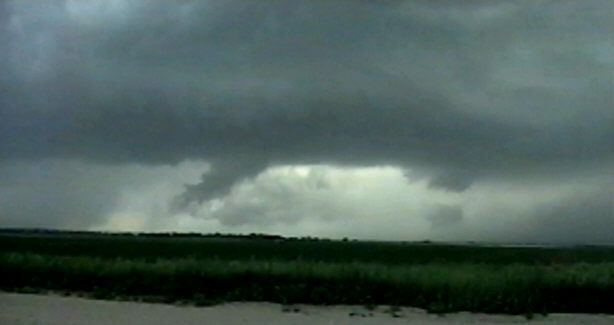 Then back next to us in the center of the wall cloud, this merry-go-round made of cloud, we saw a funnel worm out directly in the middle, like it was the main axel of the entire cloud. At first it was white and spinning extremely fast when it came down. A sheet of rain blurred it, but we could see it was on the ground. It couldn’t have been more than 200 yards off to our left as the winds continued to grow in strength. The edge of the rotating wall cloud crept over the top of our car. We were now in the bear cage, a very dangerous place to be. I backed up the car quickly so we were just on the outside edge of the rotating wall cloud and about 150 yards now from the tornado furiously spinning on the ground. We watched all around us for signs of any more tornadoes. One could easily set down anywhere and catch us by surprise if we weren’t careful. It was difficult to see where the tornado was at times because of the sheets of rain, but I could see it was moving northeast so I slowly drove forward with the car, inching forward at first and then moving faster to try to keep the funnel in our site. For a moment my partner and I lost site of the tornado so I stopped momentarily. We both wondered where the tornado was. Was it moving away from us or towards us? The car rocked back and forth from the now fierce winds and we became anxious. Then, finally the rain cleared and there it was on the left of us only 50 yards away at most. I could finally take some good photos of the tornado. We wanted to be as close as possible and still live to be able to tell about it. It was mesmerizing as it varied its path through the open field, hopping, sometimes skipping like it was some sort of deadly dance that nature had made before it destroyed everything in its path. Beautiful, yet deadly. It was about 2 Minutes after it first touched down that the rain cleared enough for us to get some photos. I have video at the bottom of the page of it, but the camera could not see the tornado as well as our eyes did so the pictures are not very good until this point of the video. It roped out about 5 minutes after this. Traveling north on Hi-way 7 leaving the city limits of Bassett, Nebraska there off to our right we could barely make out a large tornado, hidden in a sheet of rain. It was incredible as it became more visible to us. 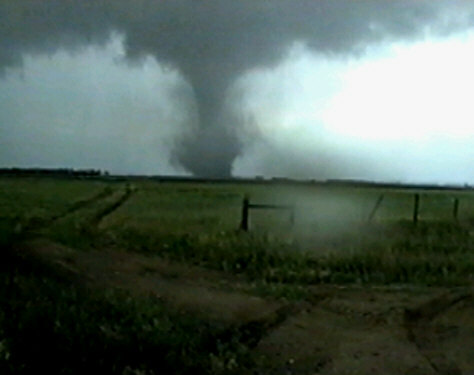 This tornado was a real monster and was much larger than the sleek rope tornado we just left. I drove fast to try to catch up to it as it ate up the open prairie. There were no other cars on the road for about 6 miles, then we came across storm spotters parked on the side of the road keeping their eye on the tornado. It was the biggest tornado I had come across this year. 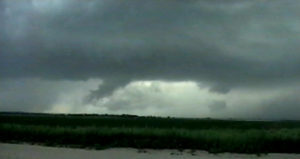 The entire cloud above it was rotating and is very visible in my video of the tornado. Kyle videotaped the tornado as I drove. 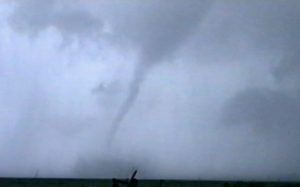 The tornado changed size as it spun along the ground. Sometimes it was many times wider at the base then others and sometimes it was wider in the middle and top of the funnel. As the tornado continued on through the fields it appeared to be tightening up and spinning faster. It was getting narrower and slowed in movement. Later we learned the tornado had just destroyed a family farm. We were also told nothing was left of the family farm that had been there for many years. Those are words you hate to hear, but it is the reality of tornadoes, they are dangerous and very destructive. Strong well-built homes are no match for a tornado as strong as this one, so that is why having a storm shelter is so important.